A happy childhood didn’t keep Rachel Roberts from leaving her hometown of Cincinnati the moment high school was over. From her start as a ski bum and whitewater rafting guide to her positions in the corporate world, she built a life in Colorado that hit all the adult milestones – some good, some not so good. She married, divorced, and discovered yoga. But it was on a solo trip around the world where she finally found her future and her way back home. 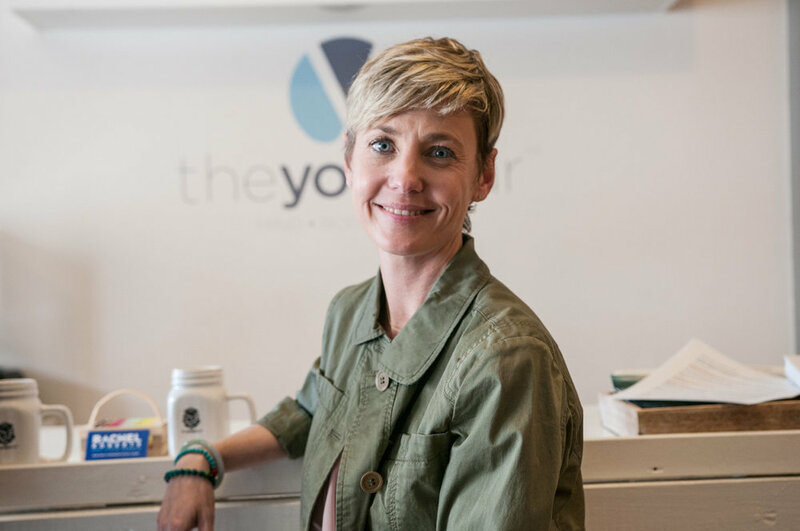 She is a recognized business and community leader: a personal coach, speaker, founder, owner of The Yoga Bars in OTR and Newport, and – along with her husband – owner of Rake, a branding firm focused on small, minority-owned business support. Now, she is running for the Kentucky 24th District Senate Seat on a platform of stable healthcare, good jobs, and excellence in education. She found the time to meet up at her Newport Yoga Bar studio to have a conversation about learning to trust herself, taking chances, and the role of friendship, community, and service in her life. Interview by Teri Heist. Photography by Dyah Miller. Women of Cincy is an apolitical organization dedicated to giving a voice to women of all beliefs. We encourage our readers to have open minds, make informed decisions, and be engaged in their community. You grew up in Cincinnati. What was your childhood like? I had a happy childhood. I had a great set of parents who always worked in civil service. My mom is director of Hamilton County Mediation Division, and my father worked for the Mental Health Board; he was a dual-diagnosis specialist with them on mental health and addiction issues. You left Cincinnati after high school. As an 18-year-old, what were you looking for? Even when we were dirt broke, my parents always fostered in me that we needed to take care of those that were less fortunate than us. I moved to the Virgin Islands for a hot minute, came back, and started going to the University of Cincinnati. By then, I had fallen in love with snowboarding and was going to Colorado in the winters. The first time I drove out to Colorado was in a VW microvan with a bunch of friends; 13 of us lived in a three-bedroom house and I was broke. I spent about two years going back and forth: I would be in Cincinnati in spring, summer, and fall, and spend my winters in Colorado. You moved full-time to Colorado and were working in the ski industry and as a whitewater rafting guide. I’m assuming there were not a lot of women in those businesses at the time. No, not at all. When I started to climb up the ranks in the ski industry and became a snowboard rep, I believe I was one of three female snowboard reps in the country at that time. Rafting was a little more balanced; it was probably 30 percent women, and it was great. The rafting company was a family company. It didn’t matter what gender you were, but how hard you worked and how much fun you were to work with. Colorado didn’t seem to have strict gender roles – it was more about how athletic and talented you were. You had to prove yourself through your abilities. After your self-described friendly divorce, you quit your job in Aspen, left Colorado, and bought a solo “Around-The-World” ticket. Did you actually go around the world? I did! I was just really lost at that moment, so I thought that this was a way to heal myself. I wasn’t living the life I was supposed to be living. I wasn’t doing what I was supposed to be doing. This was the first time in my adult life that I had a chance on my own to change everything if I wanted to. So, I bought an around-the-world ticket and I traveled for two years. My big takeaway was that the two years I traveled alone gave me the self-confidence that I had never had before. I had never traveled alone. I had always had relationships. I had never been single; I had never been alone. So, to travel around the world and lay out a path because it was what I wanted to do helped me to truly understand who I was, what my desires were, and what drove me. How did you find the confidence to do it? Because of yoga. During the period that I was getting divorced, the moments that I felt most like myself – or when I had the clarity to try to deal with what seemed insurmountable at the time – were my drives home from yoga class. And I wanted to live in that space all the time. So, I decided that I would go to a teacher training program. At the time, I didn’t think that I would ever teach; I just thought of it as therapy for myself, but it blossomed into something much bigger than that. Did you have plans to start a yoga studio? No, not at that time. I just did it for personal development. But about halfway through my first teacher training course I was like, “Oh, this is what I’m supposed to do.” I had been a raft guide, a ski instructor; I had worked in bookkeeping and business management, and I had a marketing degree, and I had worked in resorts. When I got a divorce, a big part of it was, “Why can’t I focus on one thing?”, “Why can’t I figure out what my path is?” But once I figured out that I was supposed to be teaching yoga, it made sense to me: All of the jobs that I ever held set me up for success to be an entrepreneur. When did you decide to come back home? When my travels were winding down, I felt compelled to come back to the city I had grown up in. And Colorado didn’t need another yoga teacher, but maybe Cincinnati did. I never imagined myself coming back home, but every sign was pointing me to come back home. I felt that it was time to be back for my family and I still had a really good group of friends here from high school. I was still traveling full-time, but I came back to town July 4, 2009. I ran into my high school boyfriend, who is now my husband. So, I came back to marry my high school sweetheart! 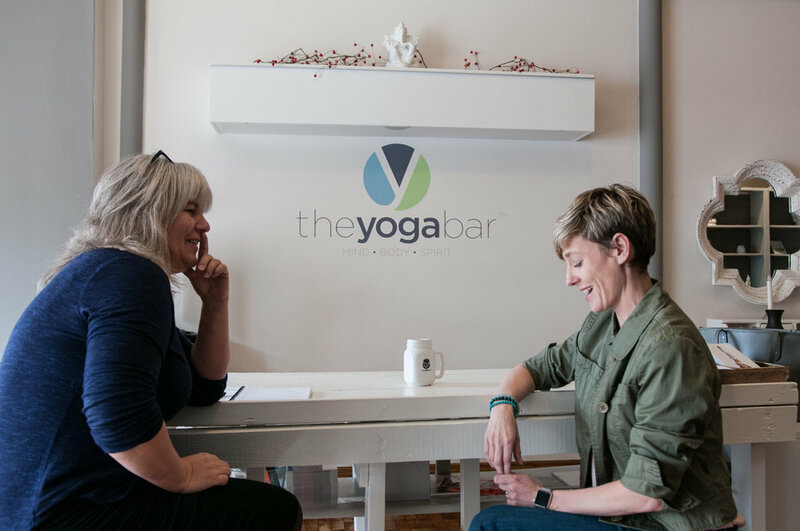 A unique aspect of your Yoga Bar studios is the bar – a place to sit down, have tea, and linger after class. Why is that important to you? To feel safe when I was traveling full-time, when I went to a new country I would splurge on a nice hotel the first night. I had access to a concierge who could tell me everything about the city and I would go immediately to a yoga class. The yoga community would embrace me, and I would feel like I was actually a part of something. I would learn about the right café to go to, the right yoga teacher to study with, etc. There are so many times in our society when women are pitted against one another, and I’m grateful that that hasn’t been my personal experience. I wanted to bring that back to my city. Because when you practice here, the people who are on the mat next to you, you want to know them. They are coming to the mat, taking time for self-reflection and introspection, and actively trying to better themselves. It is such an intimate thing that we share when we practice yoga together; it breaks my heart to see people just leave and not take advantage of the connection that could be made in the studio. Running for political office is the latest change to your life. And you’re running as a Democrat in the 24th district of Kentucky? For a Democrat, that’s a tough district. Why are you running? I first started thinking about running for office four years ago. I didn’t because, on the local level, other people were doing a really good job that I could get behind and support. But things are different now. I stand in front of the studio classes and I say all the time that if we can do better, we must do better. My way of doing more and doing better is to run for this office. I have the capacity to do it, and I feel this deep need to serve. This is a way for me to serve in a bigger, more important way. You know, if there had been a great candidate who was running for this seat who I felt was the right person for the job, I would have been happy to throw my full support behind that person. But I am the right candidate to be running for this job this time. How important is it that you are a woman running for political office in Northern Kentucky? Women have been underrepresented in the Kentucky General Assembly, and truly at every level in Kentucky politics, for far too long. Woman make up more than 50 percent of our population. They should make up a similar percentage of our representation, as well. What are your chances of winning this election? My firm belief is that this is a flippable seat. I will have to work very hard. But I am super driven. This is not about me; it is about us. I will always be an advocate for Northern Kentucky. Win or lose, I will be a champion for this district. But I can be a more potent champion when I win. As a female business owner and political candidate, do you experience challenges that are unique to being a woman? Women who start businesses are historically far more risk-averse than their male counterparts. We are less likely to seek outside funding or to take on debt to open businesses, and as such, we often slow our own growth potential. I don’t consider failure, failure; I just consider it a learning experience. My husband's favorite example of this is when someone says to him, "Thanks for allowing her to run," or "It's nice that you let her follow her dream and do yoga all the time." With your business success and exposure on the political stage, do you have a responsibility as a role model? There is a great motto that I first learned through the YWCA: “Climb-Tug.” As women, we have a responsibility to be the best we can be as individuals and to break through that glass ceiling. But we also have an equal, if not deeper, responsibility to tug other women up with us every time we get to take a step up. And this doesn’t have to be female specific; I think it’s community specific. I want our community to be stronger, healthier, more inclusive. So, whenever our community climbs, my responsibility is to tug anyone who is still left behind up with us. Outside of business advice, what general life advice would you give to women? Figure out the three things that truly define you. I have an exercise where we guide people through stripping off the labels that we attach to ourselves. So, your name isn’t left on the list; your political affiliation isn’t left on the list; your job title isn’t left on the list. What I usually get down to is: I am loving. I am creative. I am curious. So, if I make my decisions from that place of truth – “Does this foster the part of me that is loving? Does this feed my curiosity? Does this allow me to be creative?” – then that tends to be a good North Star for me. The other huge piece of advice is to find a meditation practice, to find time every day to be still with your own thoughts, focus on your breath, and slow everything down so that you have the time to observe, rather than react. Your past is full of what could be called leaps of faith: moving to Colorado, marriage and divorce, quitting your job, traveling the world, starting businesses, and now you’re entering politics. Why do you think you’ve been able to make these big changes in your life? I don’t know if I have an answer. I definitely have a philosophy of “leap and trust that the net will catch you.” And that has been my experience. That isn’t to say that I haven’t made mistakes or stumbled along the way. But I am innately adaptable and innately curious, so I don’t consider failure, failure; I just consider it a learning experience. What woman has influenced you the most? My momma. My mother is so strong and so resilient and absolutely brilliant. Her parents passed away when she was quite young. She was married, but my biological father left right after I was born, and so for the first three years of my life she was a single mother. She didn’t have family help, but she had a great network of friends who were very supportive. And then she met my father, John, who adopted me when they got married. She went back to law school when I was almost done with high school. She’s just an amazing example to me of what resilience means, of what you can do when you work hard, you’re blessed with intelligence, and you foster your friendships. Once I figured out that I was supposed to be teaching yoga, it made sense to me: All of the jobs that I ever held set me up for success to be an entrepreneur. What do you think the thread is that has lead you both to be doing what you’re doing? We know the humble beginnings that she and I both came from and we know that there were forks in the road and that each of us managed to choose the right direction each time to lead us to the success and the beautiful lives we have now. And we have always been there for each other. There are so many times in our society when women are pitted against one another, and I’m grateful that that hasn’t been my personal experience. My girlfriends have always risen to support me, and I am so grateful to be able to rise up and support them when the opportunity comes. What is your philosophy on how life works? I don’t know why I get to be so fortunate this lifetime. All I know is that I work really hard to be grateful for it. And that seems to help my fortunes to continue. The two years I traveled alone gave me the self-confidence that I had never had before. That lesson was instilled in me by my parents. When I was young, I’m sure we were living paycheck to paycheck. But I also knew that we were more fortunate than others. My dad’s private practice was in the ground floor of our apartment, so we would have people who were addicts knocking at the door at 11:00 on a Friday night because they needed his help. My dad would always open the door. When friends were between jobs, they would live with us. Even when we were dirt broke, my parents always fostered in me that we needed to take care of those that were less fortunate than us. At this point in your life, how do you define success? Success is working every day to make my community stronger. To leave the world better than I found it. To be as much service to as many people as I can possibly be. Since I moved back here, what has guided me more than anything else is a sense of service. So, I come at the business, or I come at running for office from a place of “this is about us; this isn’t about me.” Then I succeed.